BQEYZ’s sprawling line-up is mostly made of in-ear headphones with names that contain a “K”. 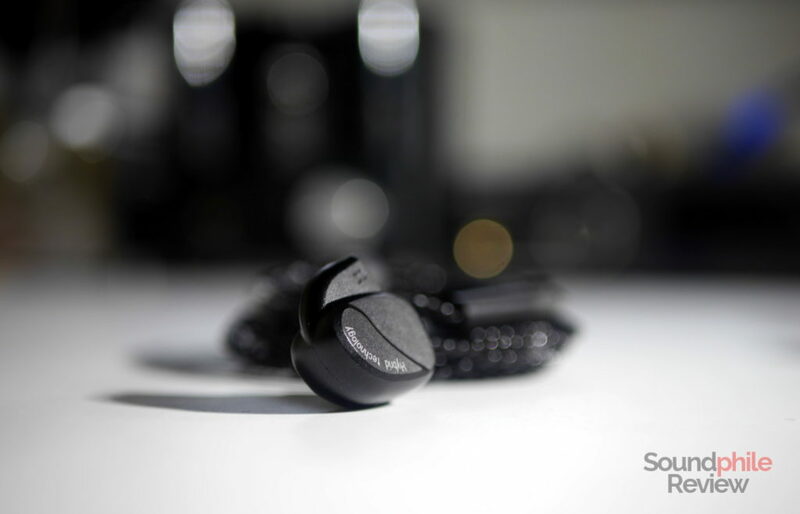 Case in point, the BQEYZ K2, a huge aluminium-clad IEM that is surely well suited for the fun side of listening to music while also offering fairly good technical ability for the more demanding listeners. Disclaimer: this sample was provided by AK Audio and I won’t have to return it. They are on sale on AliExpress at $49 at the time of publishing. 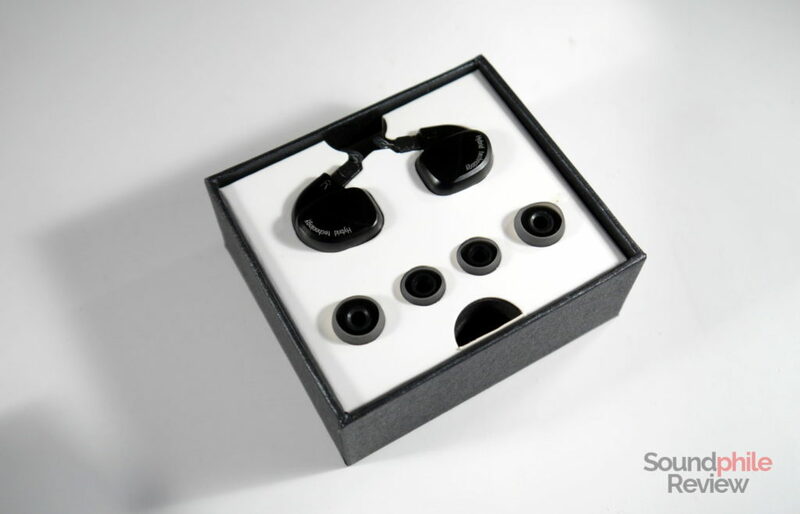 Packaging is fairly standard, with a cardboard box holding the earphones, the cable and three silicone eartips. Nothing too fancy – it’s pretty down to basics. Whereas many companies nowadays tend to copy the Campfire Andromeda, the BQEYZ K2 take the opposite route of trying to stand out with an original design. 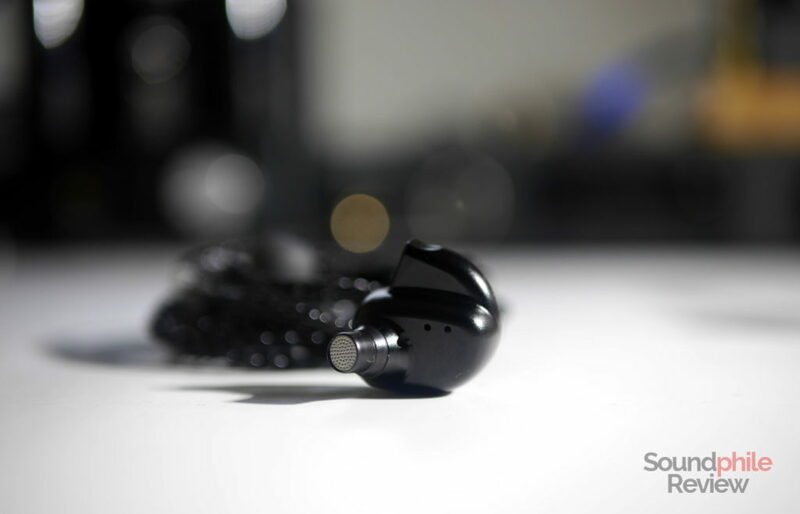 While it’s similar to the Andromeda in terms of overall shape, as most IEMs with replaceable cable are, it’s really different when it comes to how it really looks, being it a large rounded body having a protrusion on top with the cable connector. The shells of the BQEYZ K2 are smooth and rounded whereas the Andromeda’s are squared and full of edges. They’re made of two pieces of aluminium, while the nozzle is made of plastic and it’s closed by a metallic grille. They’re solidly built, almost to the point of being able to survive after being run over by a tank. Jokes aside, the BQEYZ K2 really look like they are durable and resistant; they are also assembled well and the junctions between different pieces are barely detectable. 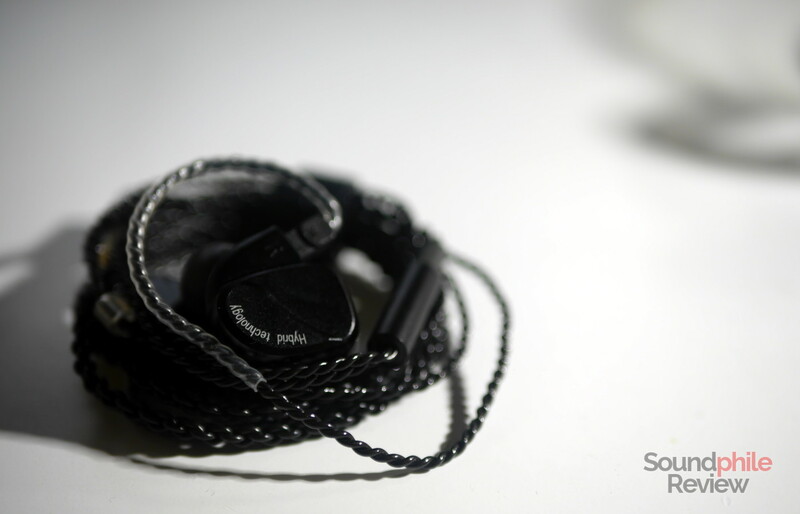 The finish is really good and beyond what I’ve come to expect from sub-$50 in-ear headphones. Isolation is sufficient, but it is not enough to withstand the trial of public transport – though sounds coming from outside are in fact reduced, the louder noises are still clearly audible. The cable is almost identical to that included in the BQEYZ BQ3 box: it’s flimsy and prone to tangling, but thankfully the ear hooks do not tend to curl up. While it seems good in terms of build quality, and it has a few nice additions such as a chin slider and a Velcro strap, it is not great and using another cable (e.g. Yinyoo 6-core copper cable, Yinyoo brown 8-core silver-plated cable) is recommended. I listened to the BQEYZ K2 using a Hidizs AP200 and a Topping NX4 DSD (with a xDuoo X10T-II as source). In both cases source files were FLACs in standard resolution for the most part. 100 hours of break-in (or burn-in, if you wish) were applied, however useless that may be. 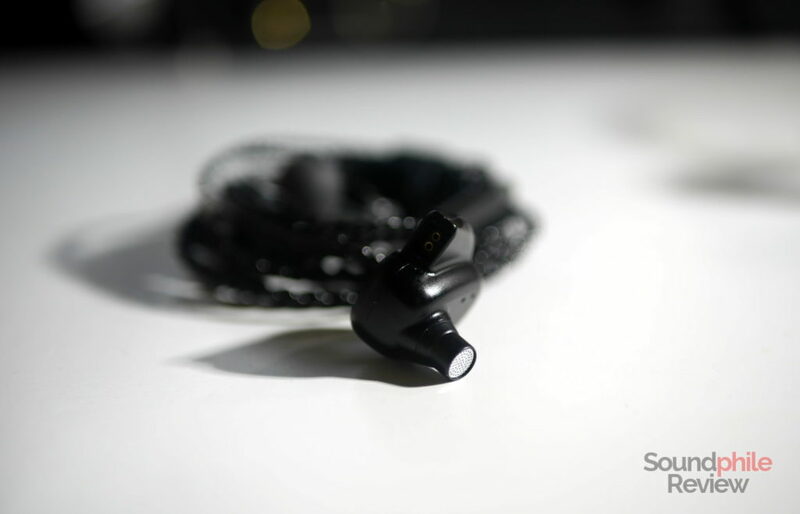 The BQEYZ K2 use a multi-driver setup that includes two dynamic drivers (10 mm and 6 mm) and two balanced armatures, similarly to many other earphones in the same price range. Unlike the BQEYZ BQ3, the BQEYZ K2 does not sport a V-shaped signature – at least not in the traditional sense. Unlike their sibling, the K2 take a more balanced approach, though bass is still a bit emphasised and there’s a small spike in the upper midrange. The soundstage is close, but decently managed so that it is actually well distributed from left to right – and that’s thanks to good imaging. It’s as if it was a small room fitted to be comfortable: though the space is limited, it is well managed to get the most out of it. Instrument separation is sufficient, but complex tracks tend to show its limits. Bass is a bit elevated, but moderately so: it is in fact emphasised and more so in the middle region than in the rest, but the bump is gentle and leaves the balance of the signature unaffected. Depth is perfectly average for the price point, reaching down to about 40 Hz and then having a rapid roll-off below that point. This things combined give the signature a warm base, without this ever turning to invasiveness or excess. Even though the emphasis in bass is limited, the BQEYZ K2 can sound fun and punchy when needed. Listening to Röyksopp’s Skulls is an immersive and intense experience, with bass having the right amount of punch (but being a bit lacking in terms of depth, alas). Bass appears punchy also thanks to speed being good: transients are fast enough to give the listener the sensation of impact, while the good control allows for some detail. Speaking of which, it’s detail that may be the weak point: distinction between different bass lines is not always easy, and lows appear more monotonous (as in: “there’s a single note”) than well distinguished and separated, with little detail that derives from this fact. Midrange is recessed by a tiny bit, so little that it is almost barely noticeable. Even in bass-heavy tracks it is never too far behind the lows, so it’s always clear and reachable enough. Tonality is not entirely balanced, as there is a spike in the upper region that makes it bright and even a bit fatiguing in certain conditions (which is, when the record already has a bias towards higher mids). Midrange is, however, still entirely enjoyable and pleasant. Detail is present in average quantity – it is not surprising, but it’s not disappointing either. There’s some decent speed here, too, with percussion instruments that deliver some impact. Despite the upper range spike, there’s very little sibilance, if at all, and this contributes to making the midrange generally relaxing. Treble is laid-back and stands behind the rest almost all of the time. It is really inoffensive, and by that I mean it is barely noticeable and really enjoyable even if you are treble-sensitive. Beyond the aforementioned bump in the upper midrange there is a steep decline that then results in a rapid roll-off of the higher frequencies. Extension is therefore limited, and the low presence of treble makes it neither airy nor sparkling – though it stays vivid enough. It is moderately detailed, but the laid-back tuning and the lack of extension make it a bit difficult to hear all the details that are in fact there. While the tuning is good for the treble-sensitive crowd, unfortunately it also entails the good ability of the earphones is masked a bit. With their tuning, the BQEYZ K2 are good for whatever you throw at them. Whether it’s Pink Floyd, some electronica or folk music, they handle it more than decently. Tin Audio T2: the Tin Audio T2 have much wider soundstage and much more clarity and detail throughout the whole spectrum. They’re in a class of their own, even though they sell at a similar price. They’re much more controlled (and therefore detailed), with better instrument separation and ability to showcase the details even in crowded situations. In terms of pure frequency response, they have a bit less lows, more balanced treble (though bright anyway) and much more extended and present treble. They’re superior to the K2 in every possible way, though some may find the K2’s tuning more appealing – but that’s up to personal preference. TRN V80: although they share the driver setup (two dynamic drivers and two balanced armatures), the TRN V80 and the K2 could not be more different in how they sound. The V80 have a strongly V-shaped signature that emphasises bass and treble while leaving mids in the back rows. This results in midrange being much clearer on the K2, and on bass and treble emerging more on the V80. Detail is comparable, despite the added emphasis on the two ends of the spectrum, but the V80 still has the edge. Soundstage is a bit better on the V80, as are imaging and instrument separation. RevoNext QT2: the QT2 offer a V-shaped tuning that’s still well balanced: lows are a tad more prominent, while treble is much more emphasised (and it has better extension, too) and midrange appears a bit further back. There’s more detail in the lower region, as bass is more defined and controlled; midrange is similarly detailed but, as it is more recessed, it appears more distant and it’s less easy to grasp the details; treble, on the other hand, is more in the spotlight and allows one to have a better impression of what’s going on (fine details included). Soundstage is a bit wider on the QT2 and imaging is better in its ability to position instruments on the stage, while instrument separation is much better. Among the sub-$50 in-ear hedphones, the BQEYZ K2 are among those that I would define “really good”. Although there are in fact better options out there from a technical and/or tuning standpoint, the K2 are highly enjoyable and their laid-back attitude makes for a relaxing listening experience. If we sum this up with the great build quality and original design, we have a good product on our hands. Their only real flaw is the large size, which makes them uncomfortable in a matter of minutes. Comfort aside, they’re good enough to warrant a try! In terms of sound quality How does this compare to the AS10? Hey there! Bass is a bit more emphasised on the AS10, but the difference is minimal; on the other hand, it is more physical on the K2. Midrange appears to be brighter on the K2, and treble is much more prominent on it too, especially in the lower area. In terms of technical ability, the K2 appears to have a slightly narrower soundstage and comparable imaging, while instrument separation is better on the AS10. It seems to me like the AS10 is also better in terms of detail retrieval.